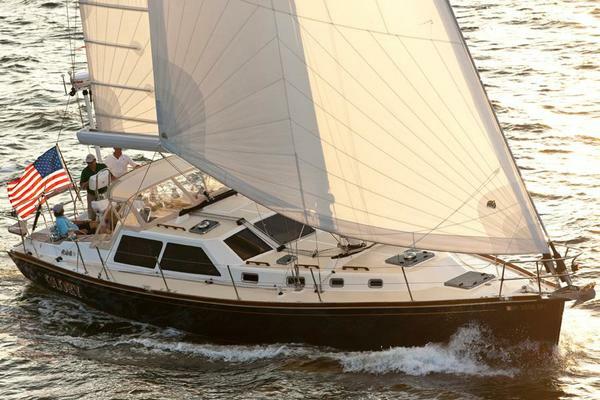 The Dufour 560 GL flagship sets the highest standards when it comes to aesthetic appeal. The yacht exudes modern elegance, luxury and dynamism with its sweeping lines and uniquely Dufour top fixed hatch, with angled corners and horizontal sleek side windows, the GL 560 delivers a striking visual statement. The collaboration between Dufour Yachts and the talented design of Felci Yachts has been renewed, with the Grand Large 560 being the 23rd consecutive project developed together. The result of this collaboration is a very balanced hull shape, with powerful aft sections, low wettedsurface area and a very effective set of appendages (keel & rudder). The high ballast ratio and increased form stability of the hull enables the boat to support a powerful sailplan without sacrificing cruising comfort and safety. The sail plan has been designed to guarantee maximum performance with minimum effort. The fixed bowsprit, the self tacking jib and the boom inclined forward are all examples of a sail plan that is derived from solo sailor open 60, where ease of handling in race mode are mandatory. 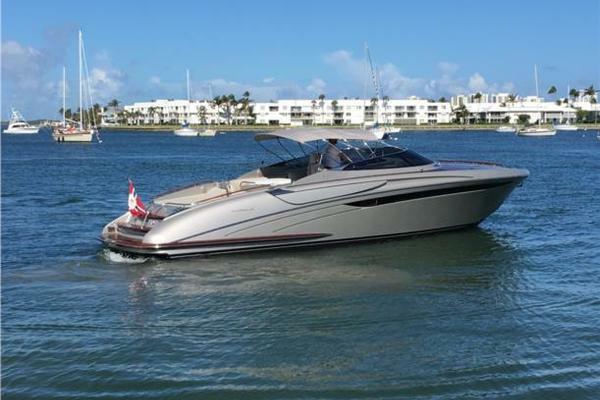 United Yacht Sales New Jersey would love to guide you through a personal showing of this 56' Dufour Exclusive 56 2019. This yacht for sale is located in Portsmouth, Rhode Island. For pricing details or a showing please contact us by filling out the form on this page and we will get back to you shortly! The Dufour 560 GL comes in several layouts 3, 4 and even 5 cabins, plus a skipper cabin, leaving maximum freedom for the customer to tailor the boat for their specific preferences.Two half bulkheads separate the Salon from the Galley. One is a cabinet that will hold dishes and the other, which is aft facing and holds a popup flat screen TV. The salonin our forward galley layout hasa U-shaped settee toport with a sliding bench centerline surrounding the salon table. An L-shaped settee can be found oppositeto starboard. The aft end of the straight settee you find a Nav Station in the (3) cabin layouts.All layoutsfeature a choice of fabrics andreal wood veneer interiors in your choice of Moabi or Oak. The Saloon has a U-shaped settee and convertible table to port. To starboard is the L-shaped settee and an adjustable Nav Station. Dufour's signature wine rack in the cabin sole holds 15 bottles laying down and 10 standing up. A drawer under the settee can hold an additional 8 bottles. The Galley forward galley is only found on our 460, 512 & 560. The functionality and use of space has to be seen to be fully appreciated. Just forward of the salon you find the full beam galley. The S/S sink with Corian covers has a brushed stainless single lever mixer tap and below sink storage. There is a 3-burner gas stove with oven and grill. The Refrigerator/freezer is front opening. There is a microwave oven in the stbd. hull cubby hole. There is a trash bin to port. Cabinets above and below provide plenty of storage. The Master Cabin has an Island King berth with a thick mattress that has a washable cover. There are 4 opening hatches above the bed. The head is ensuite.There are (2) hanging lockers with shelves, side top lockers along side of the hull and (2) pockets for storage below the berth. The master head is actually divided into two totally separate spaces. The toilet area on the starboard side and the shower on the port side. Double berth with comfortable foam mattress with washable cover. A hanging locker with shelves provides storage and there are additional top lockers along side of the hull.Access to the head is from the saloon and the cabin.A small crew cabin has been added in the forepeak with deck access via an overhead hatch. Water: Hot and cold water, chrome-plated brass single-lever mixer tap and shower head. Wash-basin: Wash-basin unit with basin in Corian®C synthetic resin. Ventilation: Via deck Hatch or opening port. Boom: Anodized aluminum fitted with 2 continuous reefers. Running rigging: pre-stretched textile including: main and genoa halyards, boom topping lift, main and jib sheets, 2 continuous reef lines, leech tensioner, furling line, downhaul tackle. Mainsail: Dacron with (2) reef points,full battens and stack pack bag. Genoa: Furling genoa with UV-protection. Decorative cove and boot stripes on the hull. NPG gelcoat with first mat impregnated with NPG resin forming an optimum barrier against osmosis. Structure: Hull bottom counter-moulded, floors laminated into the hull. Keel Options: Shoal 7' 2" or Deep 8' 2"
Rudder: Semi-elliptical shape, filled with closed-cell epoxy foam and Solid stainless steel post. Hand rails: Solid wood handrails on coach roof. Anchor locker: Molded into the deck, self-draining with built-in windlass support and anchor chain eyebolt, lockable hatch cover. Stanchions: 8 with 2 rows of life-lines. Mainsheet Traveler: On coach roof with adjusting car. Genoa tracks: With adjustable lead cars. Downhaul: With multi-purchase tackle and cascade. Through-deck fitting: Stainless swan-neck for electrical and electronic cables. Deck organizers: (2) deck organizers for halyard returns. Lockers: 2 large side lockers, lids fitted with gas struts and fixings for padlocks. BIB locker: Life raft stowage in dedicated locker. Cockpit floor: Non-slip polyester cockpit floor. Gori folding prop with "overdrive"